A recommended product by the EngineerSupply Product Team. Screw Clamp type tripods are the conventional type of clamp. Seco Screw Clamps offer large knobs that can be used even while wearing gloves. Seco's revolutionary Tri-Max tripod, stands alone in meeting today's demanding stability requirements. 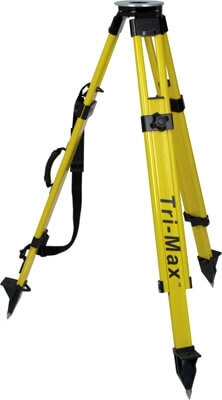 In fact, tests have confirmed that the Tri-Max, in many cases, is more than 100 times more stable than conventional tripods, and retains this stability in use, without frequent adjustments, in the face of commonly encountered field conditions such as age, wind, fatigue, contamination, wear, temperature, moisture, and humidity. What is the direct result of the superior stability that exists in the Tri-Max? Significant increases in realized accuracy (closure) is not just possible, but common! Unparalled-no other tripod even approaches the Tri-Max's performance! To develop the Tri-Max, ultra-modern materials and processes were combined. This next generation tripod was created using computer aided modeling and analysis techniques. An unique hinge spindle design permits leg rotation yet prevents lateral movement. Legs are connected with a rigid adhesive that never loosens regardless of age and environmental exposures. The entire structure is designed to dampen vibration and resist creep. Composite extensible legs are formed in a continuous wedge profile that allows more locking force to be developed by hand clamping than conventional tripods develop with their locking systems engaged. The Tri-Max is not only significantly better than all other tripods; it actually creates a new standard for tripod performance. A popular feature, the kick out prevention system (standard) is designed to prevent instrument falls on slick surfaces and from persons tripping on a leg. The system stores on the inside of the leg or can be left in place. This feature does not interfere with plummeting or instrument person's stance. One "save" is all it takes! This Tripod has a Flat Top Head. A number of accessories are available for the Tri-Max Series tripods. They include leg bags, storage bags, retractable points for finished floors, foot spikes, plates for unstable terrain, and equipment attachment snap-rings. In addition to outstanding stability, the Tri-Max tripods are loaded with other important and practical features. Tri-Max tripods feature a large, round head that is precision turned. The mounting hole is also large to aid plummeting. A snap-cap head cover (standard) attaches without screws and has a retainer strap included. Ergonomic designs include a wide carry strap (standard) with shoulder pad and a carry handle (also standard), which is unique to the Tri-Max and far more comfortable than hole-in-leg handles. Another Tri-Max exclusive feature is the open leg design, which facilitates mounting of equipment bags, data collectors, batteries, and many other accessories directly to the tripod's legs. Removal is not necessary when the tripod is collapsed and stored. Additionally, convenient utility rings (standard), for attaching accessories, are provided on the center leg caps and on the tripod's feet. The Tri-Max features a large footbed to better facilitate solid "planting" for stability. The shape of the foot is designed to solidly engage terrain, is equipped with a replaceable steel point, and is designed to accept a number of unique accessories. A special applications attachment/retention loop is provided on the rear of the foot. The foot's superior strength is clearly demonstrated when it is driven into a log with a sledgehammer without failure. Would buy again and highly recommend. By far the BEST tripod I have ever used. Our company owns 3 of these so far and yes they are a bit pricey but in the long run worth it. We got better closings on our surveys due to this tripod !